Two lawyers, one in Ontario and one in Nevada, have notified us that they have been contacted by the purported Jacklyn Kaidence with regards to a collaborative family law agreement collection. This is a fraud we have seen before under several other names and similar scenarios. For details on how this fraud works and a full list of names attached to it see our Confirmed Fraud page. Thanks for the reply.I am presently out of the country to Japan for some pressing issues . 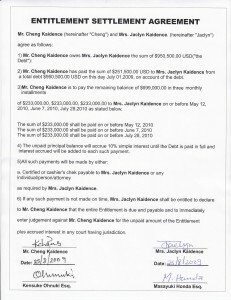 I want you to know that, my ex-husband and I had a collaborative agreement, an out of court agreement after our final Divorce Decree, to pay me a one time cash settlement of $950,500.00 usd to his credit, he has paid me $251,500 usd but still owing $699,000.00 usd. 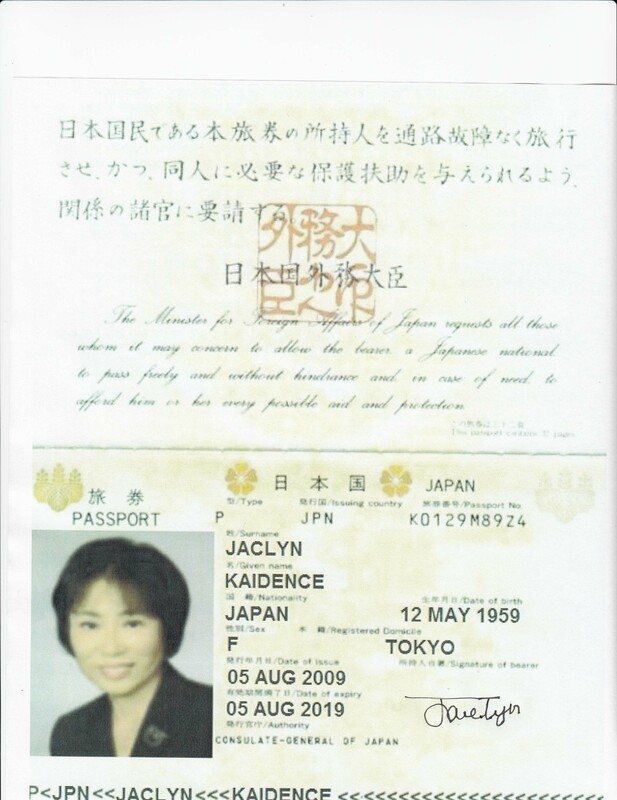 Attach herewith is a copy of the Collaborative law agreement in jpg format and a copy of my international passport for your review. I tried calling a couple of times and with the time difference(+13hrs EST) it is a little bit difficult to gauge the best time to reach you. Currently am living in South Korea for an assignment. The lawyer that represented me (Ms.Susan E. Hargrove) is retired now and I have not been able to make contact with her til date. As you know time is of great essence. As stated in the collaborative law agreement, I understand that any lawyer can represent either of us when appropriate and needed. My husband is aware of my intention to seek legal actions and I am yet to advise him I’m planning on retaining your firm. If possible please send me a retainer agreement so that we can proceed. All the necessary information I have given to you is what I can offer for now, once I receive a standard retainer from your firm, I will go through the agreement and I will get back to you within the next couples of days, and if I am satisfied with what ever I see, I will provide you with more documentations and copy of divorce decree regarding Mr.Cheng Kaidence and I, I will also give your firm a call at my earliest convenience. I hope to hear from you soonest in this regards. I am a Brazilian lawyer and I just get this message. My client name is Mrs Miyoko Kazuo. I need your help in regards to a divorce settlement with her ex husband Naoki Kazuo who resides in your jurisdiction. I am currently on assignment in S.Korea. We had an out of court agreement (Collaborative Law Agreement) for him to pay $648,450.00 plus legal fees. He has only paid me $148,000 since. I am hereby seeking your firm`s assistance in collecting the balance from him. He has agreed already to pay my client the balance but it is my belief that a Law firm like yours is needed to help me collect/enforce payment from her ex-husband or litigate this matter if he fails to pay as promised. I would love to discuses this further because of the time difference between Asia and Yours we prefer communication via email. Kindly send me your email address for me to send you more details about the case. Thanks for the reply. My client ex-husband live in Germany right now. 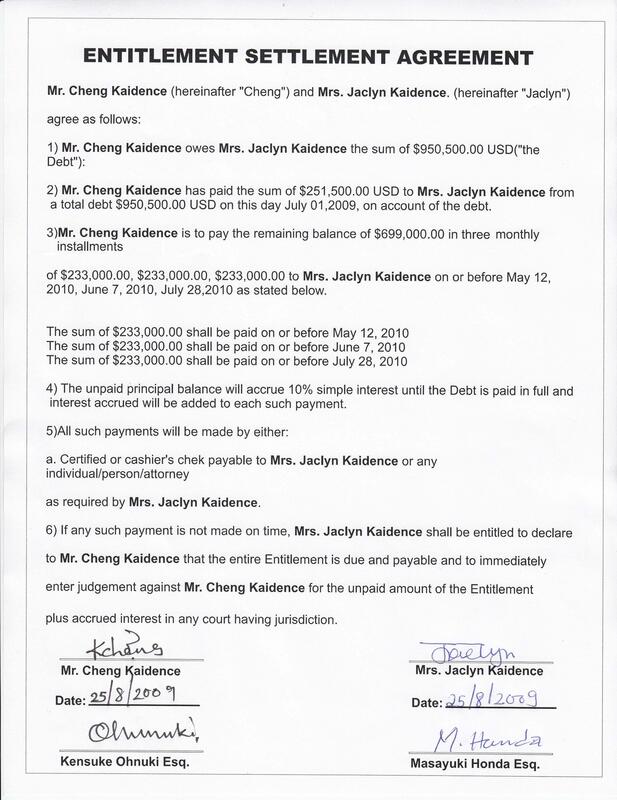 I want you to know that, my client and her ex-husband had a collaborative agreement, an out of court agreement after their final Divorce Decree, to pay my client Miyoko a one time cash settlement of $ 648,450.00 usd to his credit, he has paid me $ 148,000.00 usd but still owing $ 500,450.00 usd. Attach herewith is a copy of the Collaborative law agreement in pdf format for your review. The lawyer that represented my client is (Ms.Susan E. Hargrove) is retired now and I have not been able to make contact with her til date. As you know time is of great essence. As stated in the collaborative law agreement, I understand that any lawyer can represent both party when appropriate and needed. My client husband is aware of my intention to seek legal actions and I am yet to advise him I’m planning on retaining your firm. If possible please send me a retainer agreement so that we can proceed. All the necessary information my client has given to you is what she can offer for now, once I receive a standard retainer from your firm, I will go through the agreement and I will get back to you within the next couples of days, and if I am satisfied with what ever I see, I will provide you with more documentations and copy of divorce decree regarding Mr. Naoki and I and also give your firm a call at my earliest convenience. I hope to hear from you soonest in this regards. I am german lawyer and received exactly the same e-mail as B.Mecklenborg on Nov.29 2013. How should one raact to this ? Best to just ignore these emails entirely. I received yesterday an email like the one above from Tomohisa Shinagawa [[email protected]]. The thing is that the he connected with me in Linked In first, and then he asked my email. I have already sent you the email with the attached documents. I received yesterday an email above mentioned from Tomohisa Shinagawa [[email protected]]. He connected with me in Linked at first, and then he asked my email. I have already sent you the email with the attached documents. We have recieved e-mail from Keisuke Ide ([email protected]); parties involved: Mikazuki Kamenosuke; Hachiuma Kamenosuke. I received some days ago, an e-mails like the one above from Tomohisa Shinagawa [[email protected]] same as Mr Papoutsis and Mr Skouzos. The thing is that the he connected with me in Linkedin first, and then he asked my e-mail. He send me a chain of e-mails and i send back a retainers agreement. His client signed the agreement and after he asked for my acount info.. hopefully i found out your website..I will ignore him from now on, should i do anything more? Not much more that can be done other than ignoring the emails. Please inform me if I am at risk. I just receive a Collaborative Law Participation Agreement from him in pdf. Format. It seems to me very strange so I tried to check through the Internet. Thanks for the reply. My client ex-husband live in Ukraine right now. I want you to know that, my client and her ex-husband had a collaborative agreement, an out of court agreement after their final Divorce Decree, to pay my client Mikazuki a one time cash settlement of $ 748,450.00 usd to his credit, he has paid me $ 148,000.00 usd but still owing $ 600,450.00 usd. Attach herewith is a copy of the Collaborative law agreement in pdf format for your review. If possible please send me a retainer agreement so that we can proceed. All the necessary information my client has given to you is what she can offer for now, once I receive a standard retainer from your firm, I will go through the agreement and I will get back to you within the next couples of days, and if I am satisfied with what ever I see, I will provide you with more documentations and copy of divorce decree regarding Mr. Hachiuma and I and also give your firm a call at my earliest convenience. I hope to hear from you soonest in this regards. Hi, I am a Hungarian lawyer and first I was contacted through linkedin then via email. The below message came. I just ignore the mail. My client name is Mrs Mikazuki Kamenosuke. I need your help in regards to a divorce settlement with her ex husband Mr Hachiuma Kamenosuke who resides in your jurisdiction. I am currently on assignment in China. We had an out of court agreement (Collaborative Law Agreement) for him to pay $748,450.00 plus legal fees. He has only paid me $148,000 since. I am hereby seeking your firm`s assistance in collecting the balance from him. He has agreed already to pay my client the balance but it is my belief that a Law firm like yours is needed to help me collect/enforce payment from her ex-husband or litigate this matter if he fails to pay as promised. I am a lawyer from Croatia and i have received same e-mail as colleague from Hungary. The only difference is that in my case as Mrs. Kamenosuke’s lawyer is signed Akimitsu Kamori and the seat of lawyer’s office is also different. I also have been approached via linkedin. I am lawyer based in Zagreb, Croatia. As mentioned by other lawyers, the lawyer who sent me the emails regarding legal representation found me through linked in, then switched to email communication. Finally i received a Collaborative Law Participation Agreement from him in pdf. It seems to me very strange so I tried to check through the Internet and found this website. Everything else were like already described on this website. Thanks for getting back to me; my client name is Mrs Mikazuki Kamenosuke. I need your help in regards to a divorce settlement with her ex-husband Mr Hachiuma Kamenosuke who resides in your jurisdiction. I am currently on assignment in S. Korea. We had an out of court agreement (collaborative law agreement) for him to pay $748,450.00 plus legal fees. He has only paid me $148,000.00 since. I am hereby seeking your firm’s assistance in collecting the balance from him. He has agreed already to pay my client the balance but it is my belief that a law firm like yours is needed to help me collect/enforce payment from her ex-husband or litigate this matter if he fails to pay as promised. Thank you for the useful information. Our law firm received the Kamenosuke version. I have not proceeded beyond the stage where you are requested to provide a retainer contract. I have read the “confirmed fraud” explanation, but personally I would never advance any costs whatsoever for an unknown first-time client. Furthermore, I was initially contacted via LinkedIn, but the firm in whose name the contact was made appears to be bona fide – I am making an inquiry to that effect with the Osaka Bar Association. They contacted me via linked in with the kamenosuke version. Mr Hachiuma Kamenosuke and Mrs Mikazuki Kamenisuke. Their lawyer Takenori Heroe and their accountant Morgan Clarence. And they also sent me a check of 127.000 dollars to deposit it in my account and then transfer the money to an account they will give me. I have not deposited the check. i believe this is a money laundering case. I have asked for their passports and address and they sent them. Is anyone know how they will fraud, defraud someone or how they take money etc. I am lawyer based in Quito, Ecuador. Thank you for your useful information!! My name is Antonella and I am attorney. I come from Ecuador. I also received this scam and started an email conversation with attorney “TAKENORI HIROE”. Luckily I found this website, otherwise I would have shared information with a fraud organization. I wonder what is these people seeking. I am lawyer based in Split, Croatia. (Lawyer), Ethos Law Office,7F Nishitenma Park Bild. 3rd., 3-14-16, Nishitenma, Kita-ku, Osaka, Post code 530-0047, Japan.We googled that information and found out that there really exists website of such law office and attorney with mentioned name. In second e-mail he asked help concerning divorce settlement between Mrs. Mikazuki Kamenosuke and Mr. Hachiuma Kamenosuke,mentioned that he is momentarily in China and since all this was suspicios to us from the beginning we googled again,but this time we searched names of the clients and we found this website and that it is a scam.Thanks for posting all useful information. I am a Hungarian lawyer and have just received a very similar inquiry regarding Mr. Hachiuma Kamenosuke’s and Mrs. Mikazuki Kamenosuke’s divorce settlement. The lawyer from Osaka, Japan contacted me via Linkedin. His name is: Naoki Ikeda. I checked out his law firm on the Internet which seemed like a proper and existing law firm. I am a lawyer from Zagreb, Croatia and I just want all to know that the exact mail arrived at my inbox few days ago, with the same names as Mr. Kardos from Hungary wrote. It is also very similar as mails that my collegue from Split, Mrs. Helena Dlaka wrote about. Thanks for all information since. My client name is Mrs Mikazuki Kamenosuke. i need your help in regards to a divorce settlement with her ex husband Mr Hachiuma Kamenosuke who resides in your jurisdiction. I am currently on assignment in China. We had an out of court agreement (Collaborative Law Agreement) for him to pay $748,450.00 plus legal fees. He has only paid me $148,000 since. I am hereby seeking your firm`s assistance in collecting the balance from him. He has agreed already to pay my client the balance but it is my belief that a Law firm like yours is needed to help me collect/enforce payment from her ex-husband or litigate this matter if he fails to pay as promised. I would love to discuses this further because of the time difference between Asia and America we prefer communication via email, will give you a call when am less busy. Kindly send me your email address for me to send you more details about the case. I would like to know how the frauds exactly works, I am going to warn some other colleagues anyway..
so good we google it and you have this website.